It is a learning method that combines face to face and online classes. In other words, students go to school to attend regular classes then study their other lessons online. 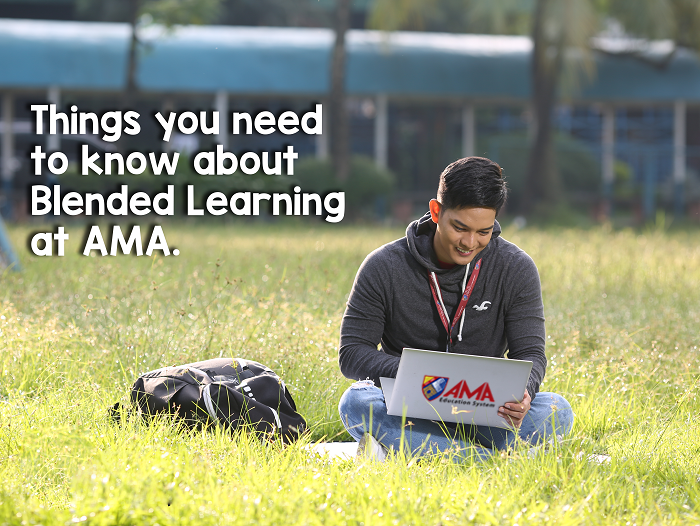 AMA Education System (AMAES) is the first to offer blended learning for Senior High School in the Philippines and is also implementing the said method for college programs. 50% of the lessons are delivered through face to face classes and the remaining 50% are delivered online through AMAES Blended Learning Platform. Students are given login credentials to the said platform so they could enter the site and study online anytime, anywhere. With AMA Blended Learning, students go to school only 3 days a week. For the 2 remaining school days, they may study online anywhere at their most convenient time. This allows students to have more time for people and things they love and provides opportunity for them to work part-time or do business. WHAT'S INSIDE THE AMA BLENDED LEARNING PLATFORM? The platform contains videos, reading materials and references that students could view anytime. It is also the reason why students of AMAES do not need to buy or carry books and printed references. All lessons and references they need for their subjects are already loaded in the platform. Some exams are also online. This allows students to have the freedom to take the exam when they are most ready. However, there is a strict duration for the online exams. Once the exam duration ends, the exam pages will be closed. Students who fail to take the exam automatically gets no grade and may need to take remedial exams. HOW DO YOU MONITOR EXAMINEES? AMA Blended Learning Platform is equipped with several features that aim to prevent students from cheating . One feature of the platform is its ability to detect movements and gestures of examinees while taking the exam. This is to ensure that the person sitting in front of the monitor is the one answering the exam and is not getting any help from anyone or anything around him or her.